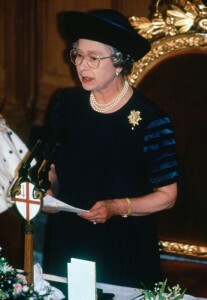 Annus Horribilis | Dr. Justin Imel, Sr.
On November 24, 1992, Her Majesty Queen Elizabeth II attended a banquet at Guildhall to mark the 40th anniversary of her accession. The Queen gave a speech and she famously said, “1992 is not a year on which I shall look back with undiluted pleasure. In the words of one of my more sympathetic correspondents, it has turned out to be an Annus Horribilis.” 1992 was not a good year for Her Majesty: The Duke and Duchess of York announced their separation, Princess Anne divorced Captain Mark Phillips, numerous press stories sensationalized the marriage of The Prince and Princess of Wales, and a major fire engulfed Windsor Castle just four days before The Queen’s speech. What an Annus Horribilis! I could sit and throw myself a pity party; after all, 2015 has been a life-changing year and not at all in a good way. However, many reasons keep me from feeling too sorry over my Annus Horribilis. One: Such an attitude is sinful: “Rejoice always, pray without ceasing, give thanks in all circumstances; for this is the will of God in Christ Jesus for you” (1 Thess 5:16-18); regardless of the situation, I’m to rejoice and give thanks – no easy task but a biblical one. Two: Beloved friends have had far worse 2015 than I: Friends have lost children and parents and spouses to the grave, a friend called last night to say that his dear grandmother has just been diagnosed with terminal liver cancer, friends have faced divorce, a dear family lost their home to fire, and some friends have faced personal crises I dare not mention in public. Three: God has blessed me every step of the way. Let me tell you some of the ways God has blessed me. First: I have a marvelous family around me. My dear wife has said several times in the past few months, “I’ll be here with you even through the bad stuff.” She has been in the past and her faithfulness warms my heart and gives me strength for the future. My boys help in every single way they can. My parents and brothers love me and pray for me. Second: I have a marvelous church family. Tammy, the boys, and I recently placed membership with the Star City church of Christ in Roanoke. The church is small and is a fairly new congregation, but they love us, they have welcomed us, and they pray for us. My family is blessed to be a part of a loving congregation. Third: I have marvelous friends. I have a support network which has loved me in so many ways. Some friends have called just to check on me. Others have emailed or Facebooked or texted to check on me. Some have listened to me when I’ve needed to talk. Others have made it possible for us to give our boys a nice Christmas in the midst of our chaos. Fourth: I have new ministry opportunities. I’ve always wanted to be a writer. God has provided me that opportunity. Five: I have been a blessing. I’m somewhat reluctant to mention this lest I make myself a hero in the story. However, I have heard from so many who have been inspired and encouraged by this blog. People have reached out to me thanking me for my honesty and my openness, and they have let me know how they have found the strength to carry on because of my blog. Some people think far too highly of me, but I’m thankful that God has allowed me to be a blessing to others. Annus Horribilis? Yes, 2015 has not been a great year on many levels. A blessed year? You betcha. God has walked with me every step of the way just as He has walked with me in the past. Put your trust in Him; He’ll walk with you. I love those words. In my opinion, they are among the most beautiful lines in English literature, and I have often read them at funerals (including my grandmother’s). What better way to end 2015 than to put our “hand into the Hand of God” and allow Him to guide us? This entry was posted in Bible, Bible study, Bipolar, Christmas, church, Deep Brain Stimulation, devotion, Doctor, Dystonia, Faith, Family, Friends, God, Health care, Hope, Jesus, Mental Illness, neurologist, Pain, Prayer, preaching, walk, walking, wheelchair. Bookmark the permalink.